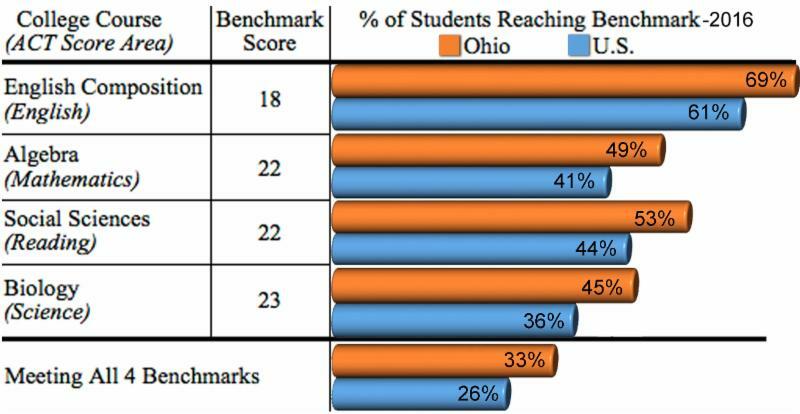 In 2016-17 all Ohio juniors will take a state funded ACT or SAT as their primary measure of high school performance. This is a growing trend across many states in our nation. The data from the ACT/SAT provide students and educators with important information regarding readiness for college and areas that need additional and/or different instruction. In preparation for this change, Stark schools are working together to raise the level of rigor for all students through their "All In" initiative. As we look at the results nationally, the average composite scores declined in states that instituted testing for every junior. According to Paul Weeks, Senior VP of ACT, expanding the testing participation leads to a substantial drop in scores that can be attributed to moving from self-selected to a fully-tested population where you are likely adding less academically prepared students. States like Kentucky - who have been testing all juniors for a number of years - have successfully implemented strategies to improve those results. For students to enter college "remediation free," they must reach the "benchmark score" identified for each content/course area. ACT Benchmark scores indicate a student has a 50% chance of obtaining a B or higher and a 75% chance of obtaining a C or higher in a corresponding credit-bearing first year college course.